We thought we would take an opportunity to showcase a few new and not so new deluxe camping gadgets and luxury camping accessories on the market. We even thought we’d give you the chance of winning one of them in our reader competition… and to do a spot of your own glam camping. You might think that taking solar power camping with you is a bit overindulgent, but think again. Running out of charge can lead to all sorts of problems from the mildly irritating through to life threatening if you’re in the wilds and the unthinkable happens. Well this unique camping gear has it covered. Having it strapped to your back can make it hugely convenient. When you’re out for the day, hiking, sight-seeing, at the beach or simply chilling in the beer garden, having your kit in a backpack recharging can help avoid potential flat batteries. The 10 litre bag is lightweight yet robust, and cleverly stores power to use for charging hand-held devices, wherever and whenever it’s needed by harnessing the power of natural light. It’s fabric is made from recycled soda bottles and is UV resistant. There is also a battery included so when you don’t need to charge your kit the bag stores the sun’s energy for you to use later. If you really want to go off-grid then this is the accessory for you to keep all your other gadgets recharged and ready for anything. When you’re camping, do you ever wish you had your video camera with you when you don’t, or maybe you do but you simply don’t have your hands free as you’re racing down a hill on your mountain bike, pulling in a fish at the lake or trying out a bit of paragliding. Well now you don’t need to worry anymore. All you have to do is buy the Pivothead video recording sunglasses, our recommended glamping gear and equipment for the campsite. In our opinion this is the number 1 wearable digital camera for sports, action and mucking about in the great outdoors. It’s rugged, waterproof, shockproof, tough and comes with a multitude of mounting options and an industry leading 170 wide-angle lens. It records up to 2.5 hours on a single charge and up to 9 hours on a 32 GB SD card. There are also timelapse photo modes and incredible sound recording. We use the HD Hero and really rate it. It’s particularly good for getting in the water with as it’s waterproof up to 180 ft. Roy Riley put together a tiny bit of footage at our beach to prove it. For more extreme action with the HD Hero, you might want to take a peek at this… and don’t hold your breath for too long while you’re watching! If you are thinking of getting one then we recommend you buy direct from the official GoPro Store as you will receive lots of extras including technical product support and a 1-year Warranty. Oh yeah… while you’re there you might also want to check out their collection of amazing footage gathered from some of the users of the GoPro Camera. It is truly inspiring stuff! The bubble tent or hut was designed to offer a dreamy space for campers and lovers of the outdoor life without disturbing nature and the environment. The cool tents are suited for unusual nights in nature, can be designed in a number of different layouts and can become a multifunction space all year long, even at the bottom of your garden. Now that’s what we call cool camping gear! For those who might want a bit more privacy they even offer a privacy barrier, and let you and your family get involved in stargazing at any time of night, without ever having to leave the tent. The cool camping Dub-Box is designed to be towed along behind your gorgeous VW camper van and offers a space for 2 people to sleep that will be the envy of all VW lovers. It has a spacious dining area that easily seats 4 adults, a huge converted double bed, a bespoke kitchenette with plenty of storage and is styled to look exactly like the VW camper van or retro vehicle towing it. This glamping trailer particularly stands out from the crowd as the new owner can choose the colours for the upholstery, work tops, cupboards, flooring, blinds and anything else that means it fits in with the style of the campervan you already own. The glass fibre body shell can also be coloured to the owners choice with a range of retro paints to compliment the vehicle towing it. Effectively it’s a gorgeous two-birth caravan that’s put together by a great company with heaps of experience in the trade… and we know they are nice as we’ve met them. The trailer is designed to ensure it’s not overwhelming or daunting to tow, which makes it a smooth, lightweight and complementary trailer that’s lovingly crafted in Herefordshire to be as individual as their owners. Yep… this one does what it says on the tin. It’s a trailer that looks like a cricket… well kind of! It’s been built to be strong, basic, light and to have all the essentials for active young campers who like to have a place to crash at the end of a long day but aren’t too bothered about having to many luxurious extras. It’s a base camp that contains everything a camper needs, but because of its low tow weight it can be towed by the vehicle you already own and reduces fuel costs. The Cricket’s shell is made from aluminium and provides insulation without warping, producing mould or horrible formaldehyde fumes (which believe it or not is a risk or many other caravans and campervans – they don’t put that in the owners manual do they!) It has a single touch roof latch that opens in seconds and the bonus of dual entry doors making access inside that much easier. The result is an economical, lightweight and athletic trailer that exceeds the usual trailer aerodynamics and durability, and gets five stars for cool camping gear innovation. This luxury tent that does everything any happy glamper would need pops up from a simple trailer. Clever huh? This trailer is aiming at slightly older and retired campers who aren’t ready to settle for anything less than the good life during their camping experience and choose to purchase this high end camping gear. 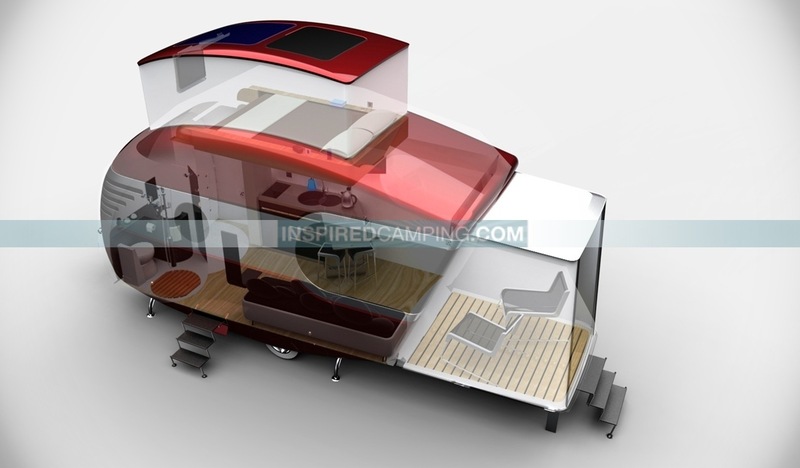 There is an extremely deluxe camping experienced designed into this product, which could have the other campers flocking to the teak veranda begging for an invitation to come on board to view the two electrically adjustable beds that can easily be transformed into one, or the hot water boiler supplying the kitchen and shower. There is also hot air heating so you don’t have to wait until the summer to head off to the campsite. Other camping gadgets and bonuses are the ceramic toilet, refrigerator and LED lighting. The Opera offers everything anyone might need for a mobile glamping experience. However, if you do choose to take it to Glastonbury Festival be aware that you might have squatters before you order your first pint of cider! Rob Villa dreamed up this beauty (our featured image) for his final design exams. It’s inspired by the classic Airstream, resulting in its sleek form, dark windows and individuality. The interior is modern and stylish with a bedroom located above the main living area which is provided by the electronically operated pop up roof and accessed by a ladder. The kitchen has a fold out breakfast bar area while the living area has a sofa which also doubles as a bed with a second slide out mattress. There is also additional space through a fold down rear panel which gives a decking area. Although this is only a concept from a designer they intended to construct it from lightweight foam to sit on top of a steel tubular chassis, which he felt would eradicate leaks often caused by plywood floors and walls found in some of today’s caravans. For those who love to go analogue instead of using digital apps this multi tool serves as a compass, watch, multi-tool with 2″ fold out stainless steel knife, scissors, LED flashlight. It attaches to your backpack, belt or camper van key ring, is water-resistant to 100′, carries a five-year warranty and looks hot! If you love the ease of disposable barbecues but hate the waste then you should check out the earth-friendly eco-grill. They are the same price as some of the disposable ones but they look great, smell better, last longer, are easy to light and offer a campfire after the cooking is over and everyone’s chilling out with their burgers. We think its so eco-friendly and stylish it’s ideal for your planned or dreamed about glamping break… and we’ve even got some to give away! Cooking alfresco with a disposable barbecue has become a lot more exciting whether camping at a festival, camping with friends, picnicking on the beach or just cooking outdoors. Biodegradable, light and compact, this ignites within 20 minutes and gives over two hours barbecue time so you can sit back and relax whilst planning and cooking your meal. At the end you have a campfire to sit around, and finally you’re left with nothing but ashes so there’s no waste to dispose of. Made from alder wood and filled with alder charcoals, its rustic design adds authenticity and a delicious smoky aroma to the food. But even better than that is the fact we have 6 stylish EcoGrills to give away to Inspired Camping readers. All you have to do is send a tweet by clicking the link below with winners being announced next week. Good luck! So now it’s over to you…. What’s the best deluxe camping gadget or glamping accessory you’ve discovered? Use our comments section below to tell us. Please be aware that this competition is for UK residents only as the product can not be shipped abroad – sorry! – but we’d still love it if you’d send a tweet by clicking above and we’ll send you a virtual hug in return. Oh yeah, you might also want to pop back next week as we have another competition for outside the UK too *smile* so sign up for our free updates and bonuses to find out more before anyone else does! By the way, if you don’t have a Twitter account don’t worry… just add your deets in the comments section below and we’ll consider that an entry. And remember… we won’t ever share your details with anyone else…. that’s a promise! See more about small travel trailers here.